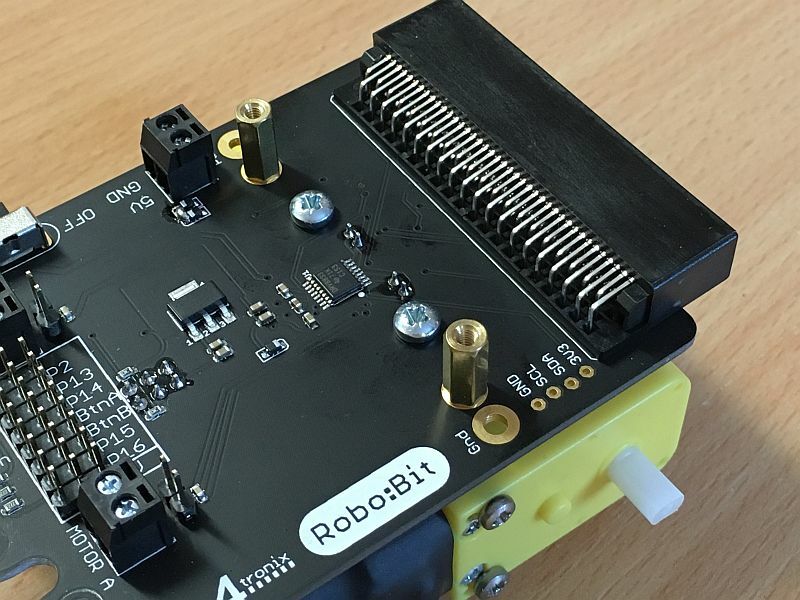 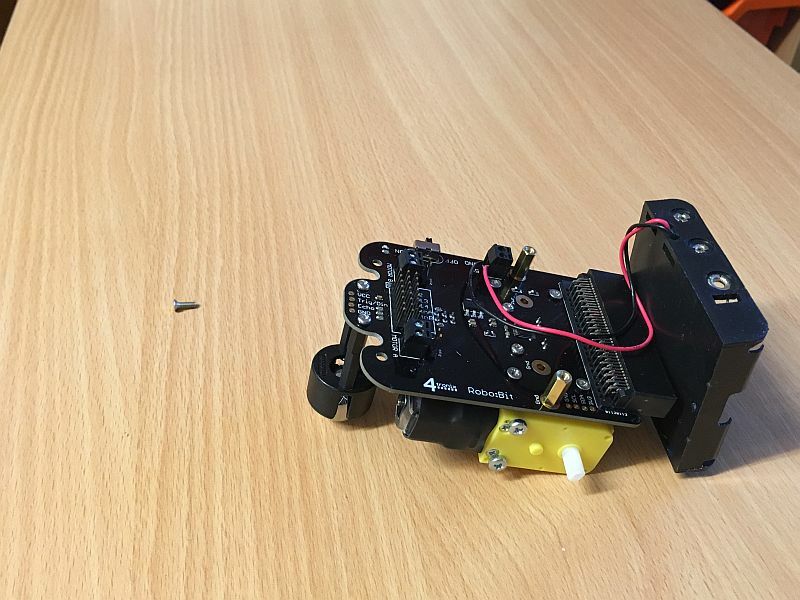 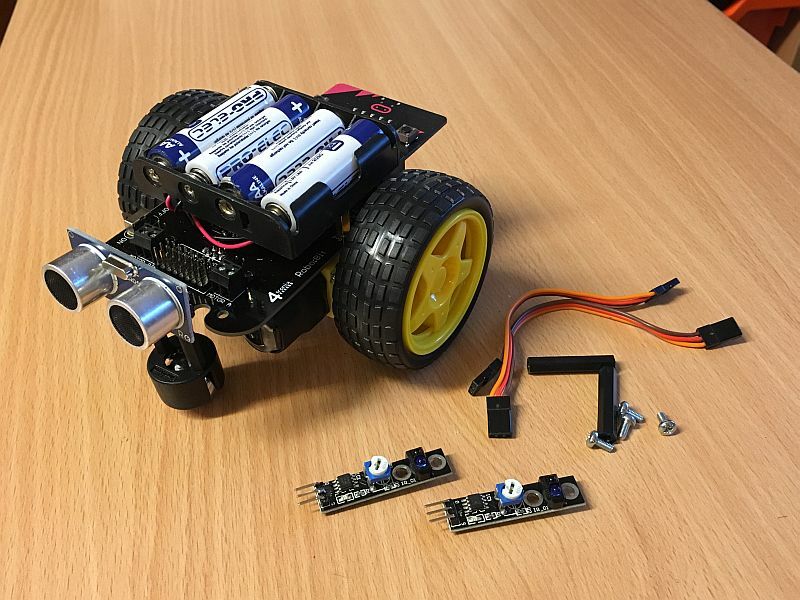 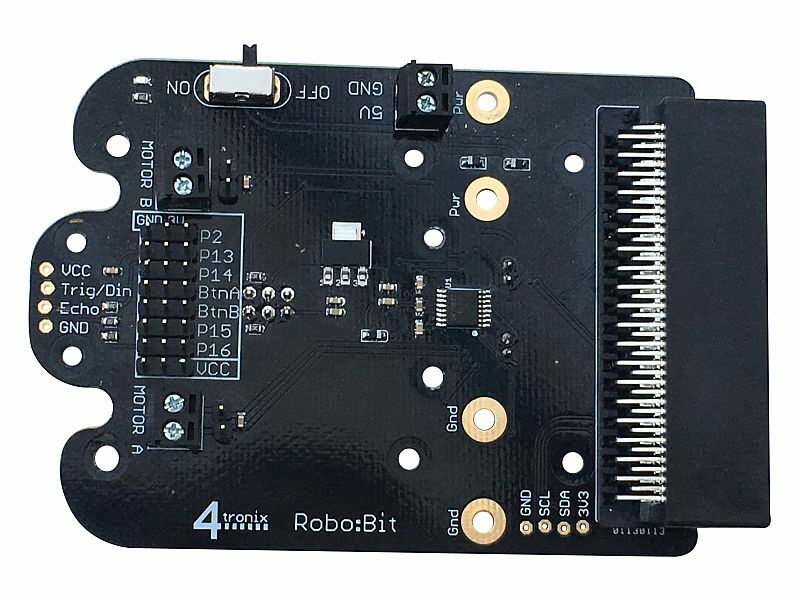 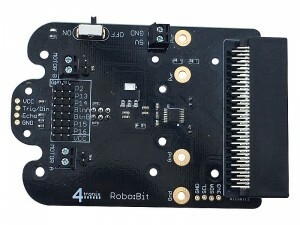 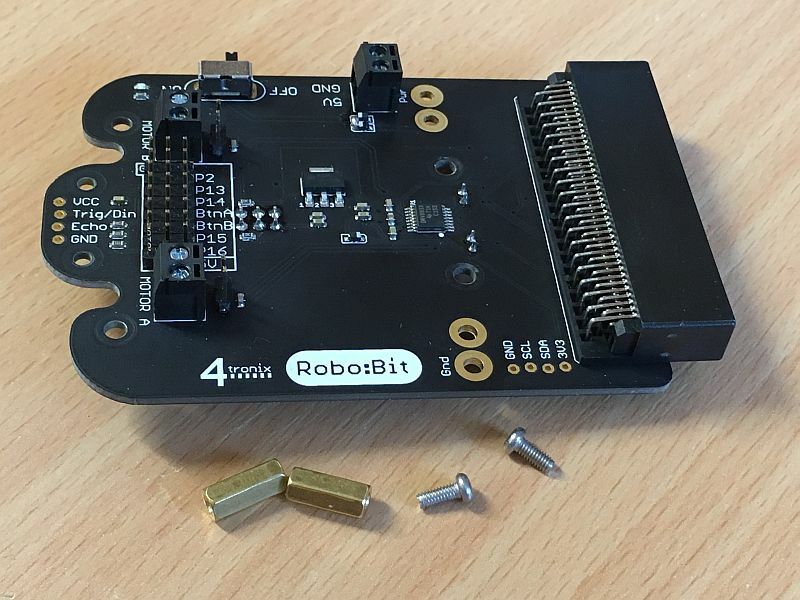 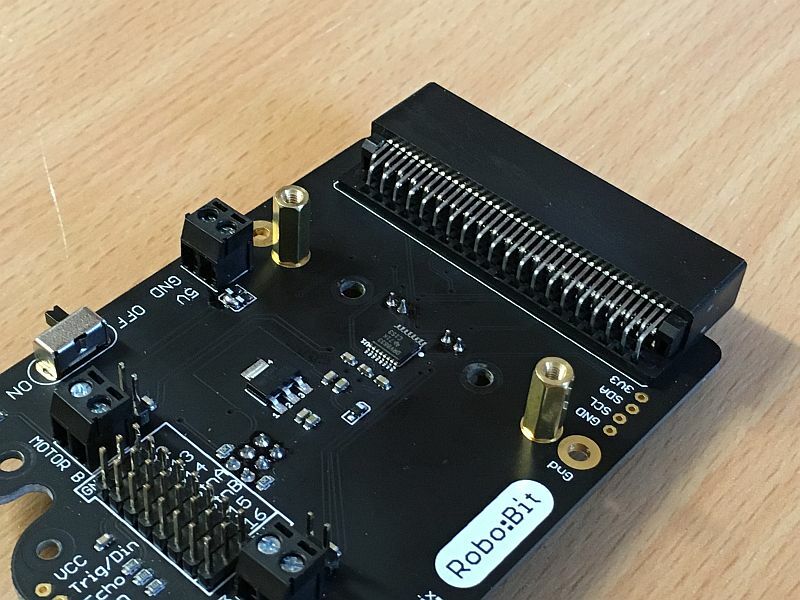 Robo:Bit Mk2 is a general purpose robotics controller for the BBC Micro:Bit, that also converts easily into a self-contained little buggy. Robo:Bit uses the same connections for the motors as Bit:Bot, so most of the software will continue to work. 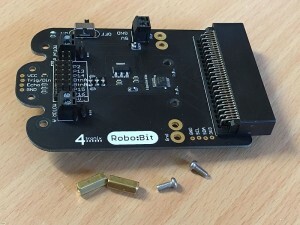 Please use the currently Beta Robobit package. for Microsoft Makecode (aka PXT). Select Advanced, then “Add Package”. Into the search bar, put this URL: https://github.com/4tronix/Robobit and the Package will show as an Orange Taxi icon on the left. For each motor there is a 2-pin screw terminal and a 2-pin male header. 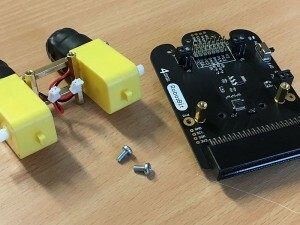 If fitted, there is also a 2-pin JST header underneath the board (used in the buggy). All three connectors for each motor are connected together. Note that this buggy can be purchased in modular form. 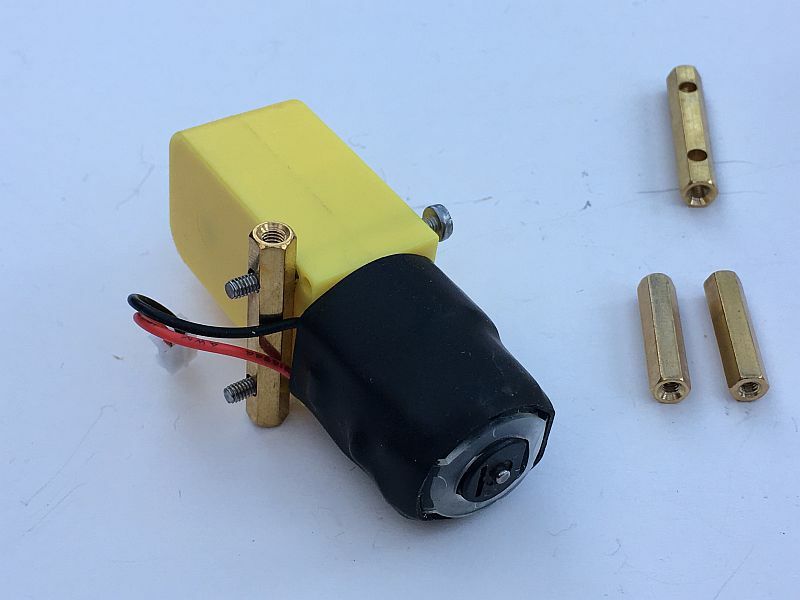 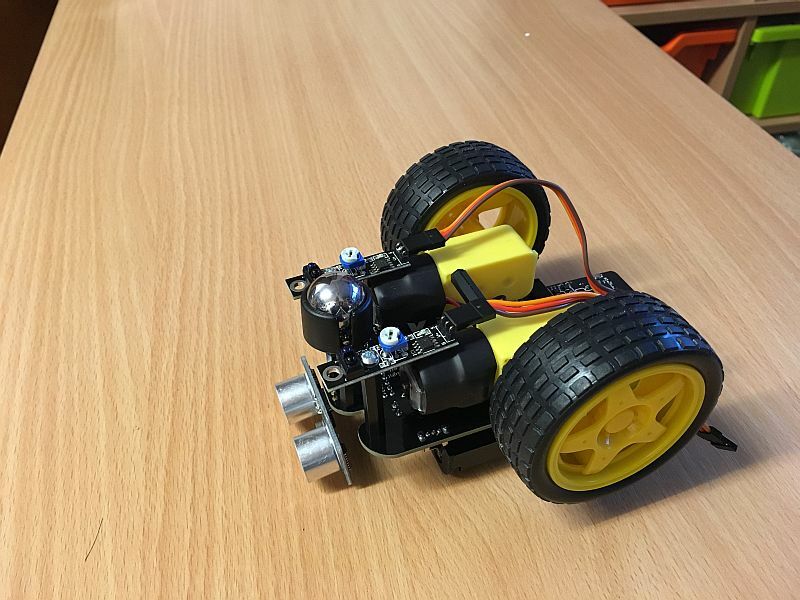 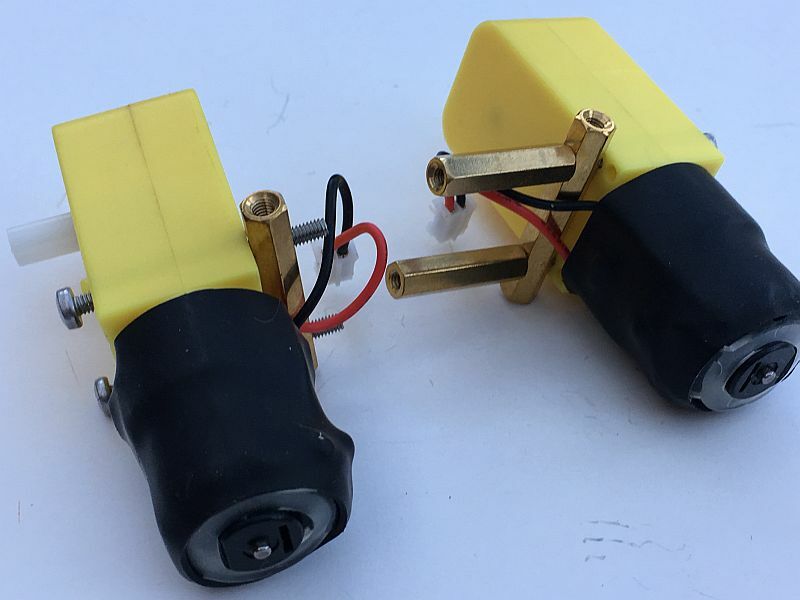 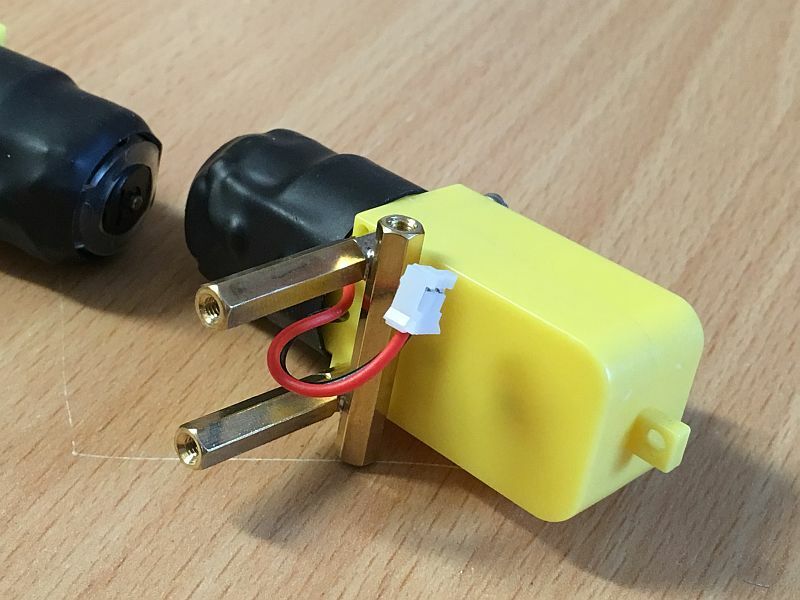 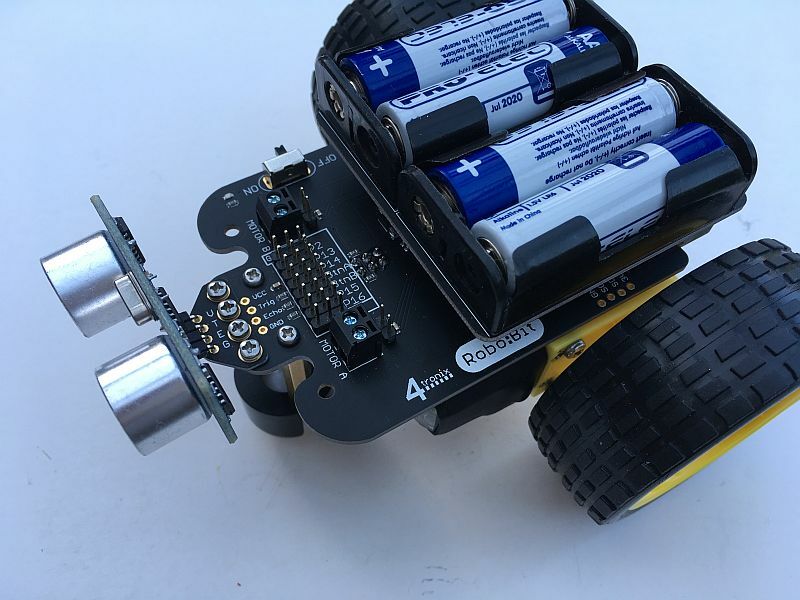 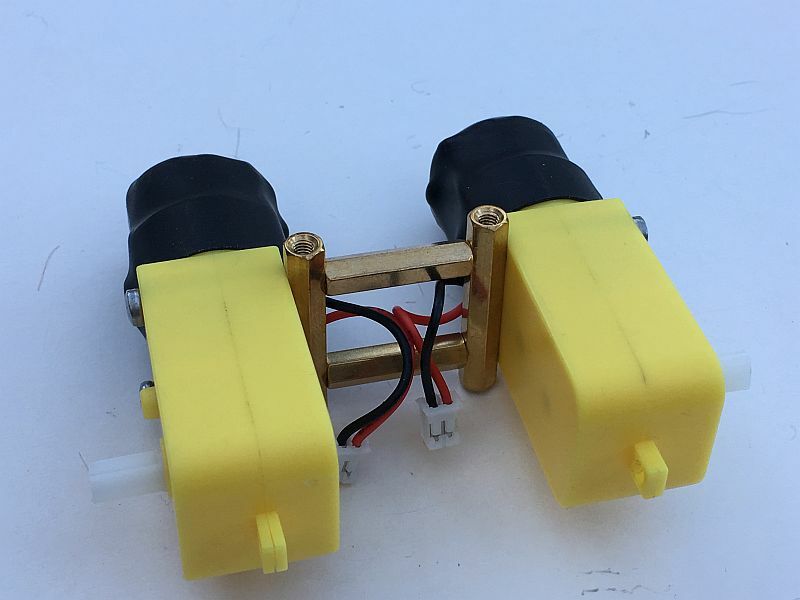 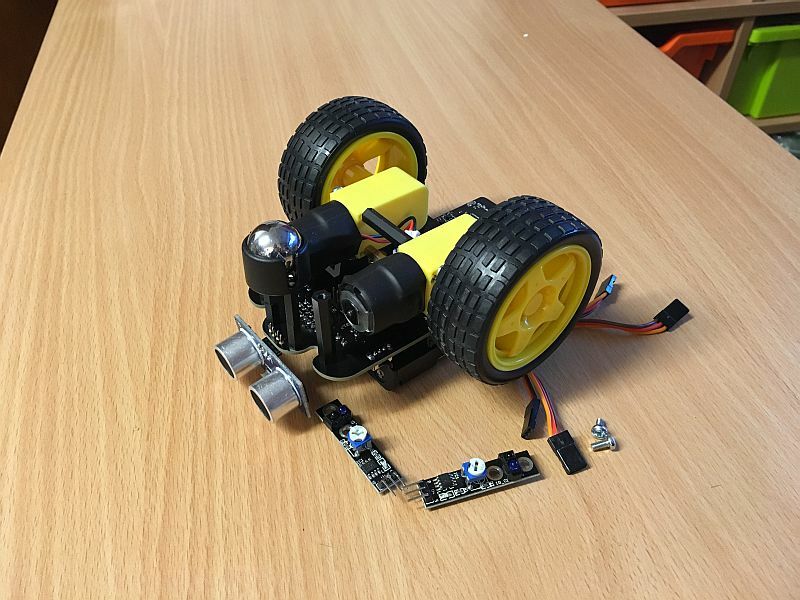 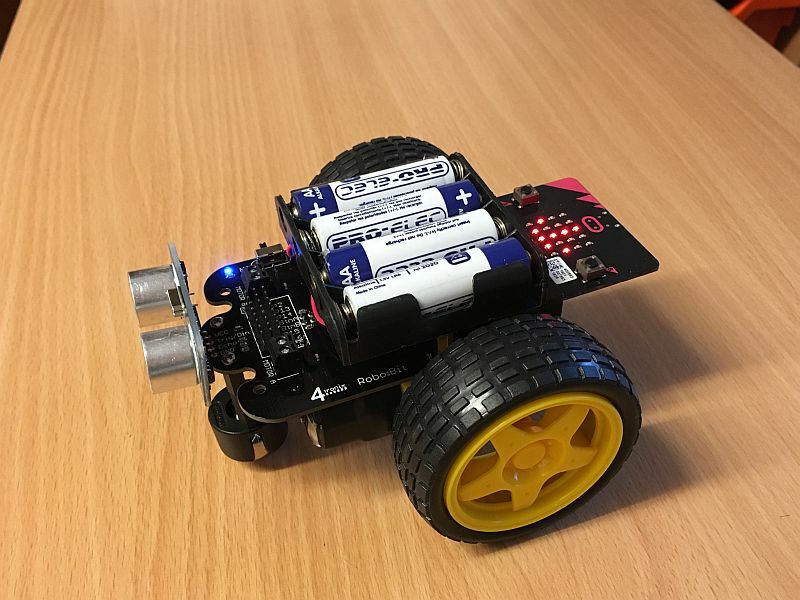 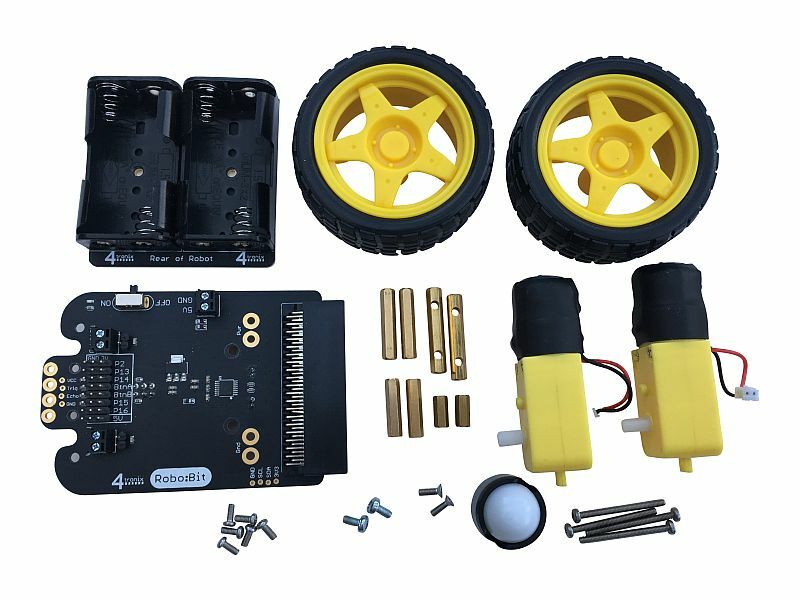 You can use your own motors and wheels if you already have them – the little yellow motors are pretty ubiquitous, so many schools and hobbyists will already have them. 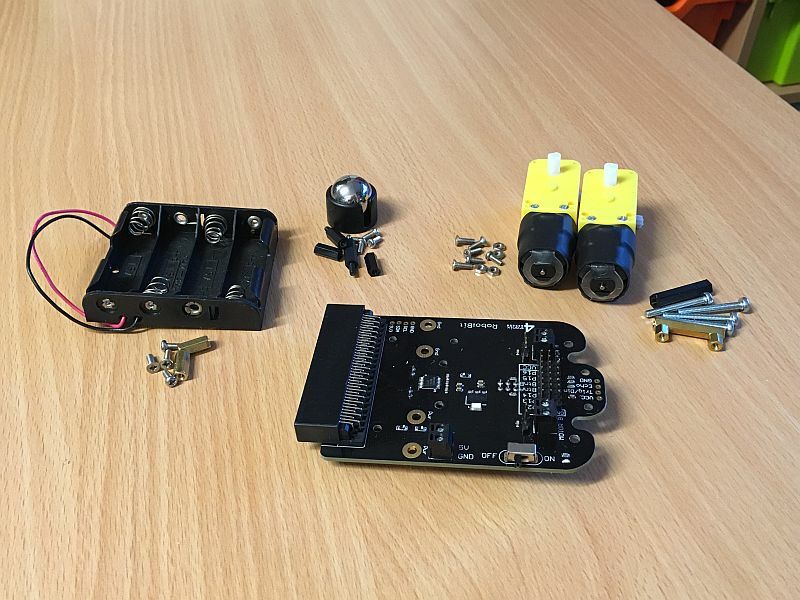 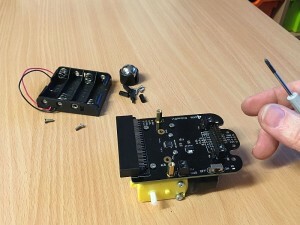 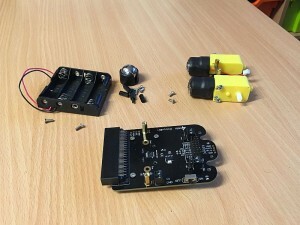 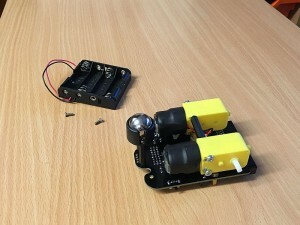 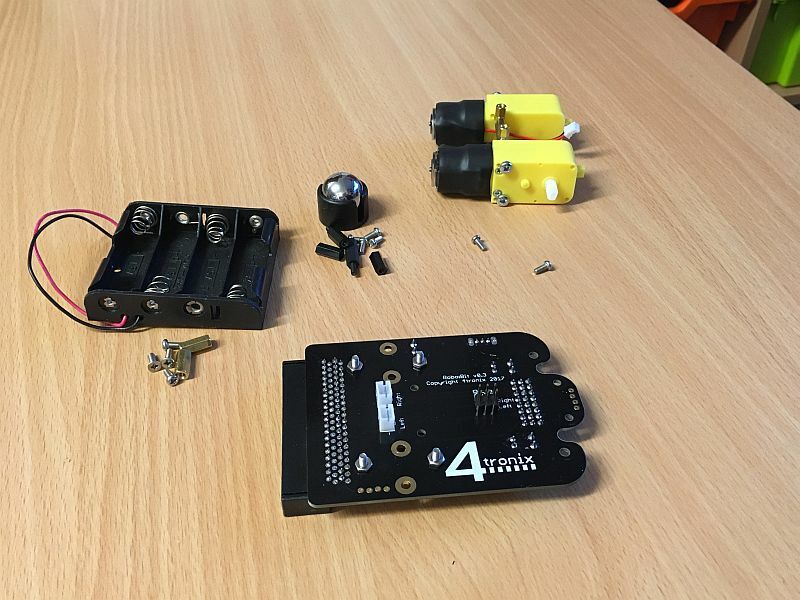 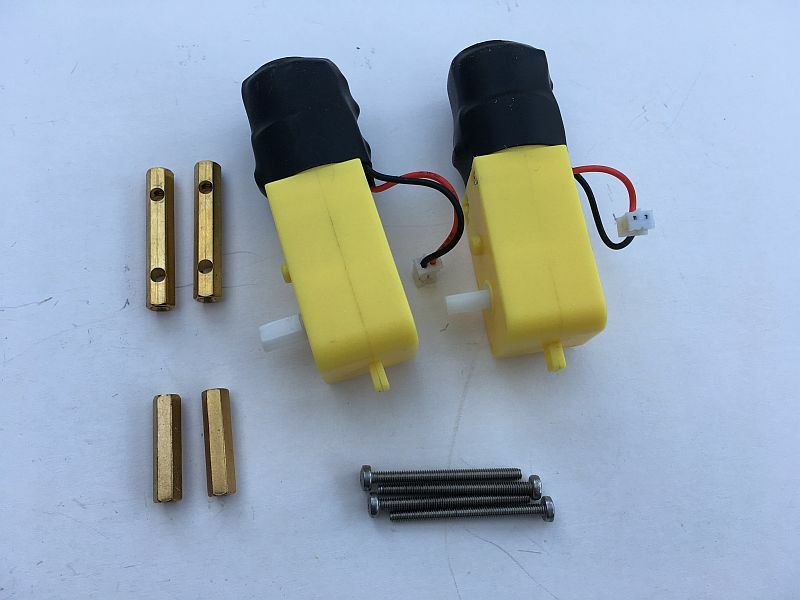 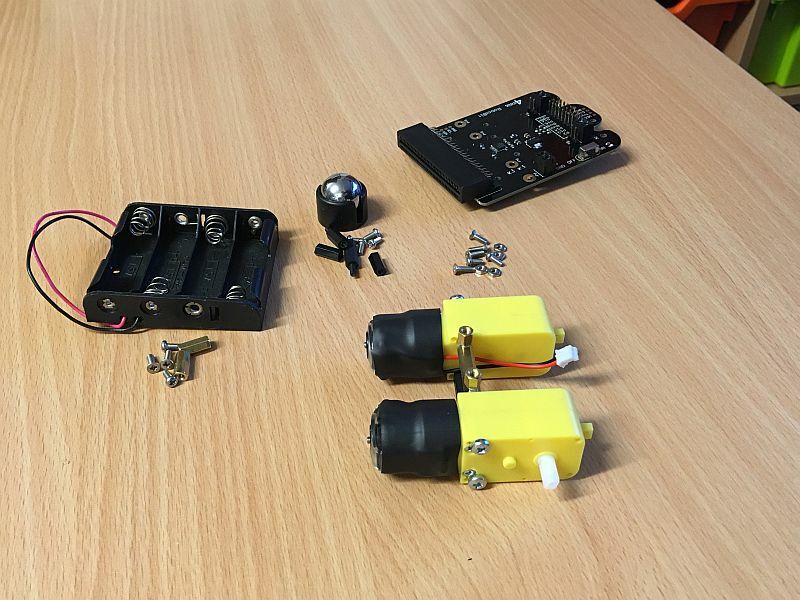 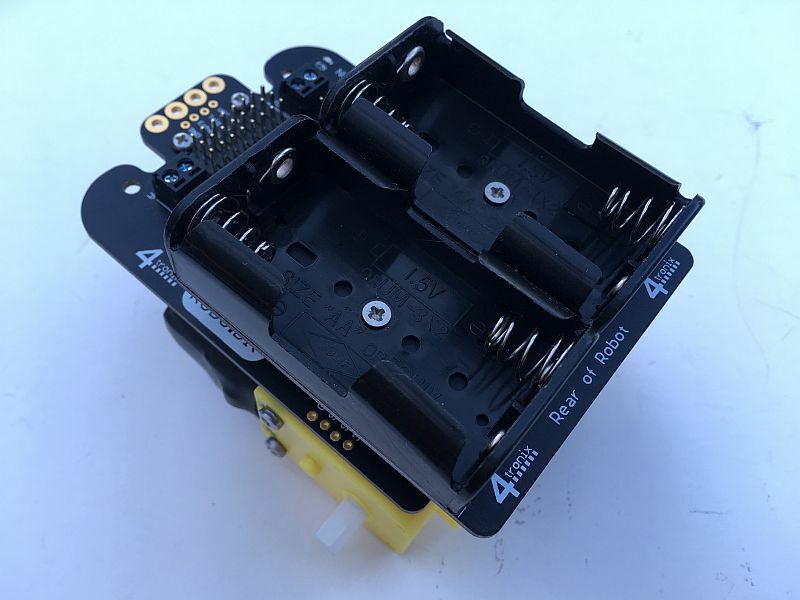 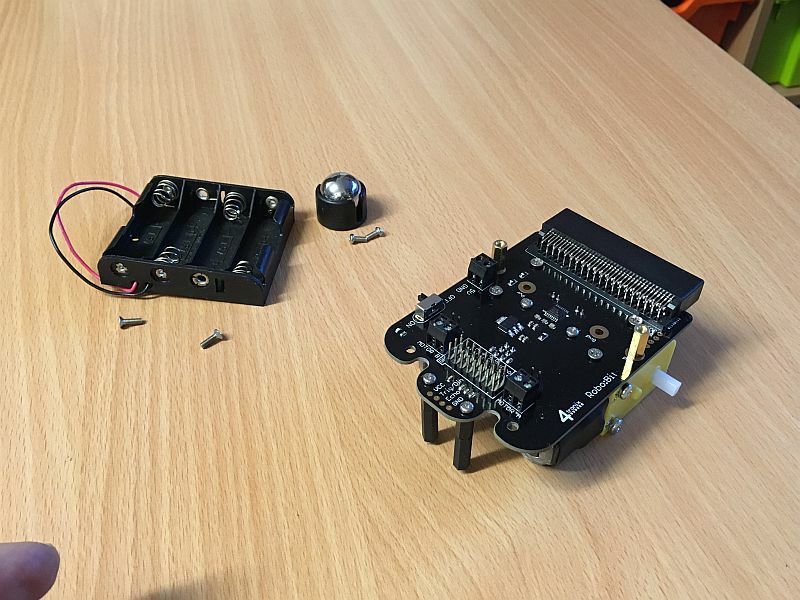 This guide to assembly assumes you have purchased the complete kit, including the ready-soldered wires on the motors – if not you would have to connect the wires to the motors and use the screw terminals on the top of the board. 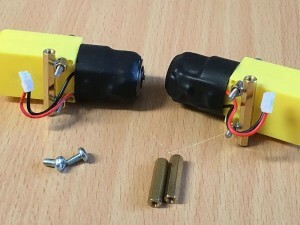 Push two of the screws through the holes in one of the motors and through the holes in the 30mm pillar as shown. Take care that the axle of the motor is on the outside and the pillar is on the inside. 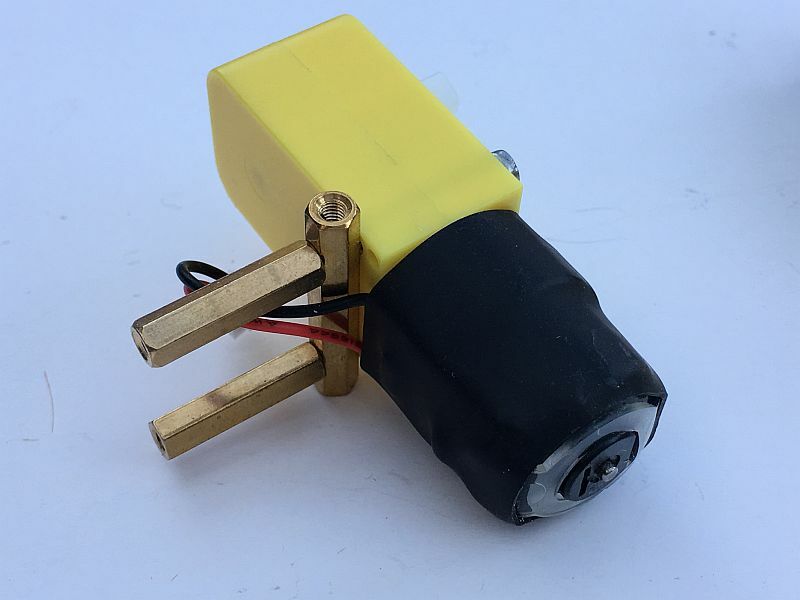 Also ensure that the motor wires do not get trapped under the pillar. 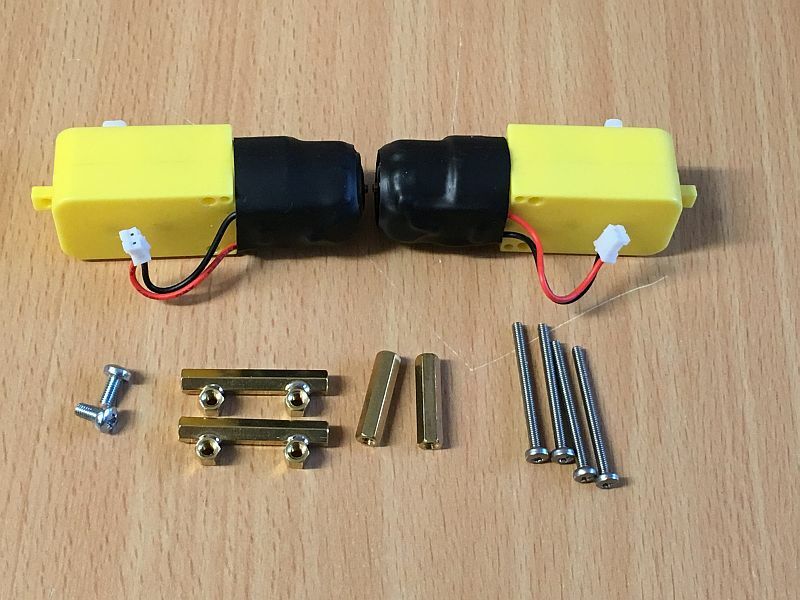 Screw the 20mm pillars on tightly as shown above. 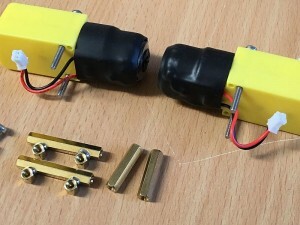 Fit 4 of the 8mm M2.5 CSK screws and the 4 nuts to the Robo:Bit as shown above. Pass each screw from the top of the board into a nut on the bottom. Tighten securely. 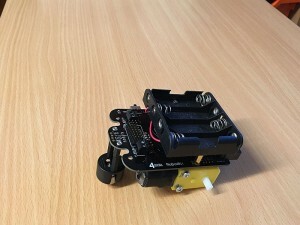 Use 2 of the 6mm M2.5 pan-head screws to attach the Robo:Bit to the upwards-facing connectors on the brass bracket assembly as shown above. Tighten securely. Push the JST plugs from the motors into the sockets underneath the Robo:Bit controller. 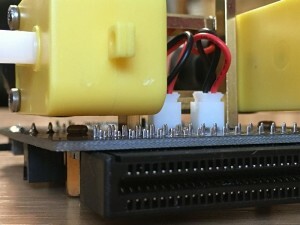 The wires are short enough to stay tidy. For v1.0 and v1.1, Screw each 10mm black nylon male-female pillar into a 15mm making it into a 25mm female-female pillar. 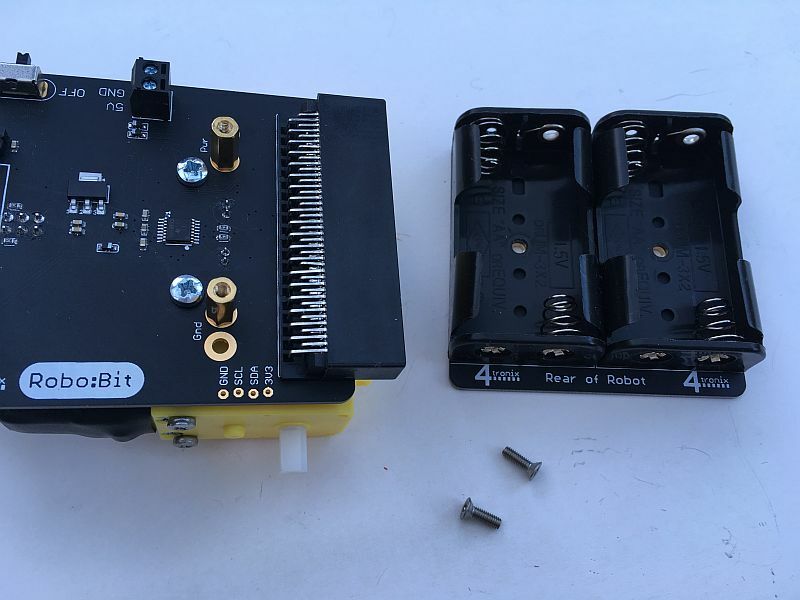 Screw the battery holder assembly tightly to the upright pillars, ensuring that the labelling is at the rear of the Robo:Bit as shown above. 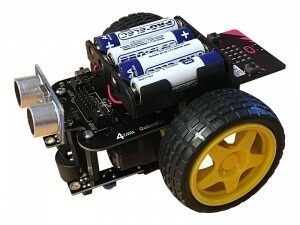 There is no need for wires as the battery power passes directly through the upright pillars. Step 7. Finish off and Go! Program -> Switch On -> Go! Each sensor has a little preset potentiometer (pot) which can be turned to define the position at which it detects a line. 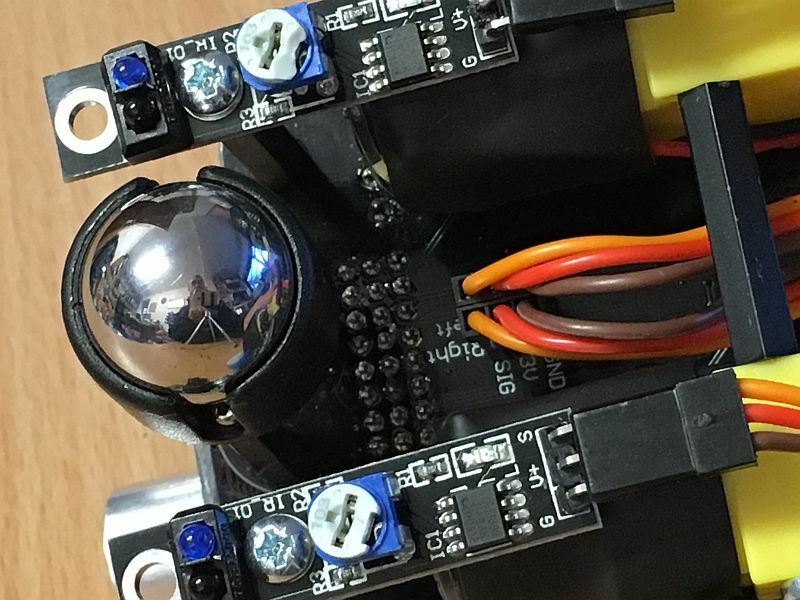 Turn the pot until the red LED on the sensor _just_ turns off. It is then at its most sensitive. 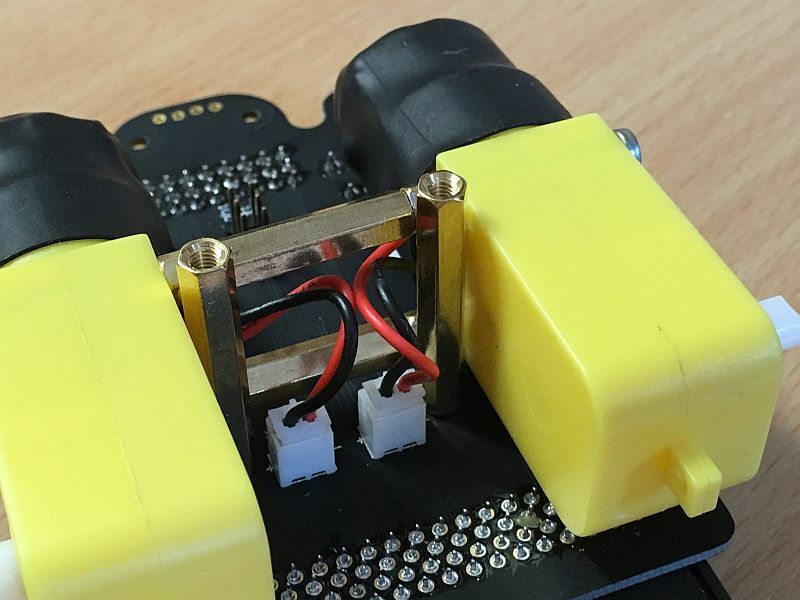 When using 3V, these sensors are not as sensitive. 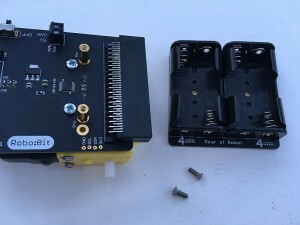 With a little ingenuity (and a different cable) you can connect the power line to VCC (the bottom 3 pins on the 8×3 header on the top of the board). 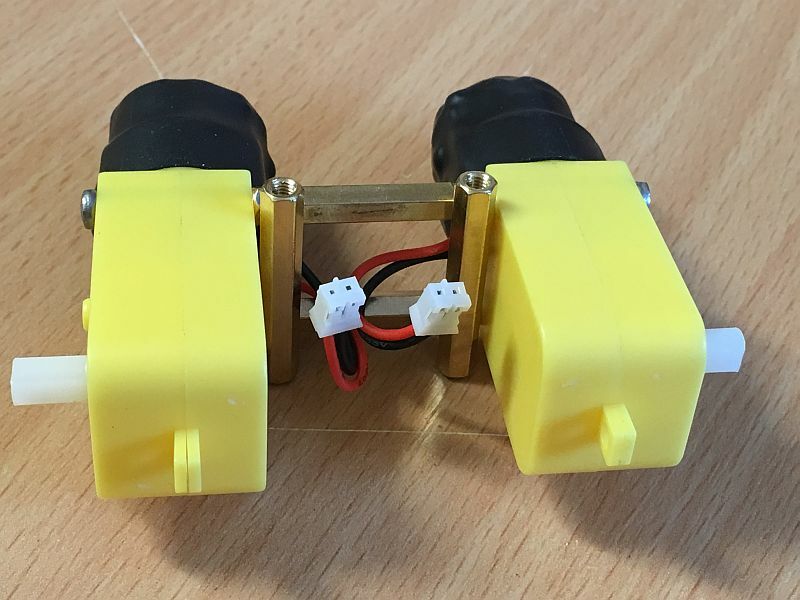 This will make the sensors more sensitive.